This Cheesecake Recipe has a silky cream cheese filling and a buttery graham cracker crumb crust. 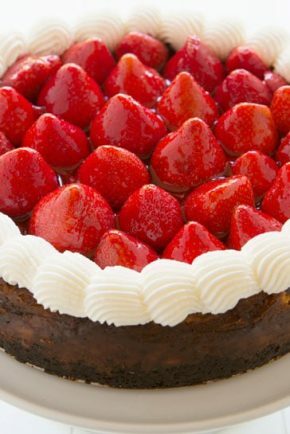 It’s a great go-to cheesecake recipe that can be topped with your favorite fruits and perfect for all of your special occasions. If you happen to prefer a no-bake version, try my No Bake Cheesecake. It’s popular for a reason! A classic cheesecake recipe doesn’t require fancy ingredients, thank goodness! They’re all things you can easily find in your local supermarket. Graham Cracker Crumbs – Can’t find graham cracker crumbs? You can always make your own crumbs by adding graham crackers into a storage bag and crushing them with a rolling pin. 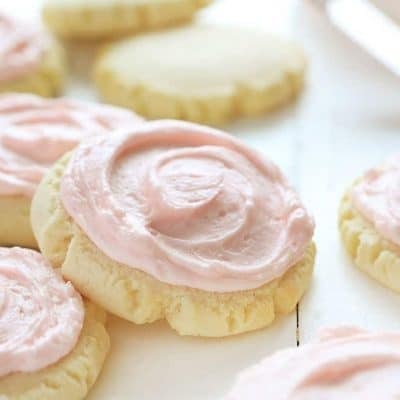 Vanilla wafers are a great alternative to graham crackers. Butter – I prefer to use unsalted butter when baking, as I like to control the salt content as well as make sure my butter is fresher. Salted butter also tends to have a higher water ratio and can affect the outcome of cheesecakes. 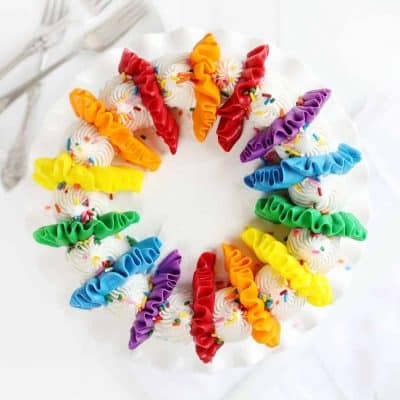 Cream Cheese – always make sure you use room temperature cream cheese. Cold cream cheese will provide a lumpy cheesecake. 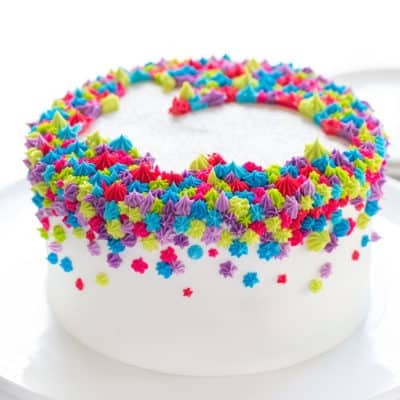 Granulated Sugar – I prefer superfine granulated sugar, but you can also use regular granulated sugar. Sour Cream – I recommend always using full-fat sour cream unless low fat or fat-free is specified in the recipe. Vanilla Extract – a great quality pure vanilla extract is always a must when it’s the primary flavor for a recipe. Eggs – room temperature always works best. Another tip is to go with extra-large eggs in recipes unless stated otherwise. An easy cheesecake crust recipe can be made from graham crackers, any cookies, animal crackers, etc. There are cheesecakes with brownie crusts and cookie crusts too, but we’re going to stick to the basic cheesecake crust recipe to keep with our perfect cheesecake theme. 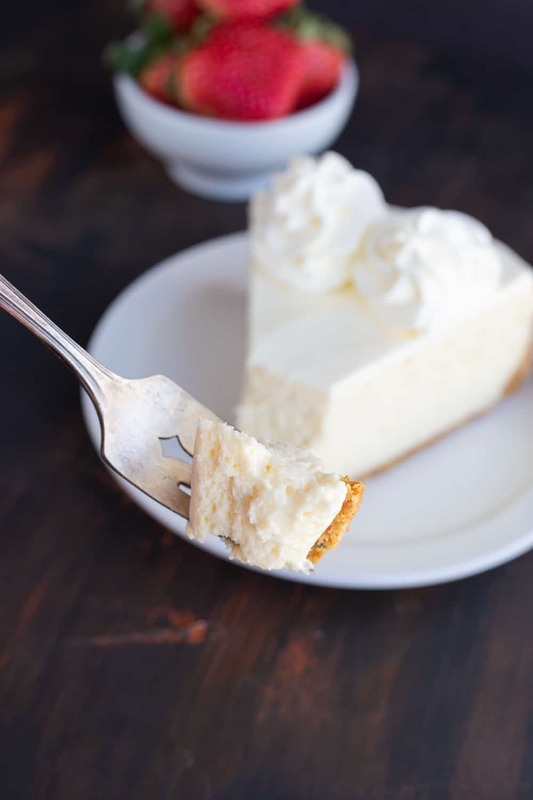 A cheesecake crust recipe is easy and typically only consists of 2 to 3 ingredients. If you’re using a cookie, you can omit the sugar. For this classic cheesecake crust, graham cracker crumbs, granulated sugar, and melted butter were used. The butter binds everything together so bits of crust doesn’t pop up in the cheesecake. The sugar is just to sweeten the deal. PRO TIP: When mixing together the ingredients (with a fork) I like to make sure every single graham cracker crumb is coated in butter. 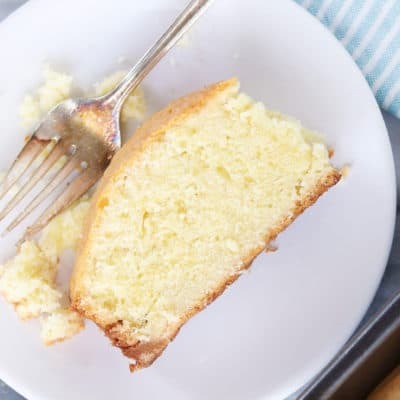 The butter acts as the binding agent, so when you see cheesecake recipes that have piles of graham cracker left of the plate, it is usually because they were not coated with butter. You can either bake the crust for 10 to 15 minutes until the edges are slightly brown or freeze it for 10 to 15 minutes until the crust is firm. 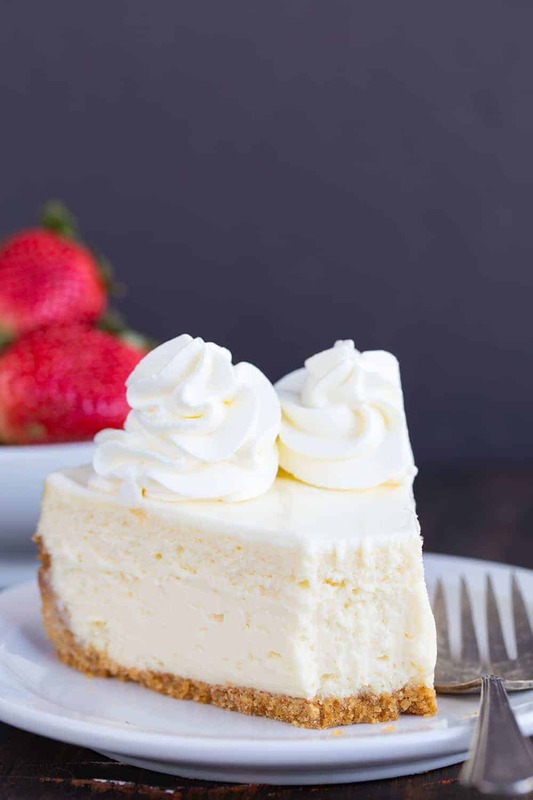 One of the most important steps in making sure you have no lumps in your cheesecake is making sure your cream cheese is room consistency all the way through. If you have to heat your cream cheese in a microwave be sure to whisk it smooth before using not only to ensure there aren’t lumps but that there are no “hot spots” throughout. I prefer to let my cream cheese come to room temperature for about 4 hours before using. 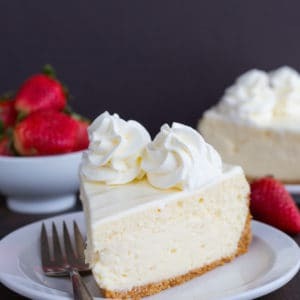 To make the cheesecake filling, grab a hand mixer and beat the cream cheese until it’s creamy, and then just the sugar into the cream cheese. 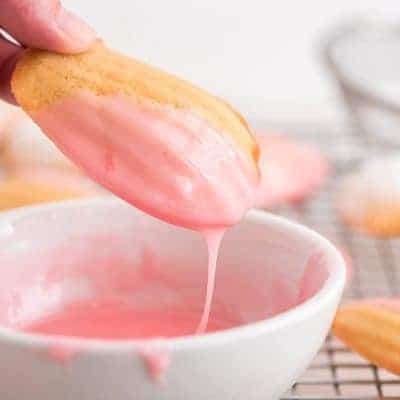 By doing this and scraping down the sides of the bowl after every step will ensure there are no lumps left before adding the ingredients with more of a loose consistency. Next, add in the vanilla extract and sour cream. Lastly, add in the eggs one at a time. Beat just until the egg is mixed and add the next egg. Do not overbeat the cheesecake filling otherwise, it may change the texture of your cheesecake. This no-bake sour cream topping for cheesecake adds a sweet and tangy flavor. I bet your favorite high-end restaurant does this too! 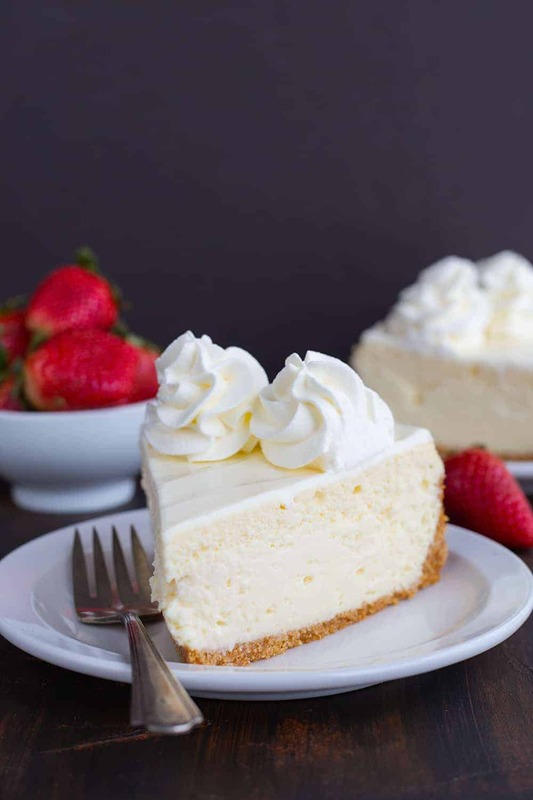 Not only does this topping add the most WONDERFUL flavor to your cheesecake, but it works great at covering imperfections if you didn’t water bath your cheesecake and have a raised edge on your cheesecake or some cracks. 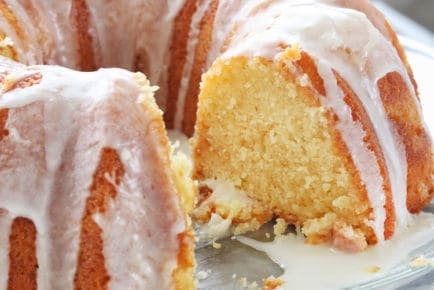 Mix together some sour cream and powdered sugar and spread it on top. I like to make sure it’s spread neatly because it doesn’t settle on it’s own. 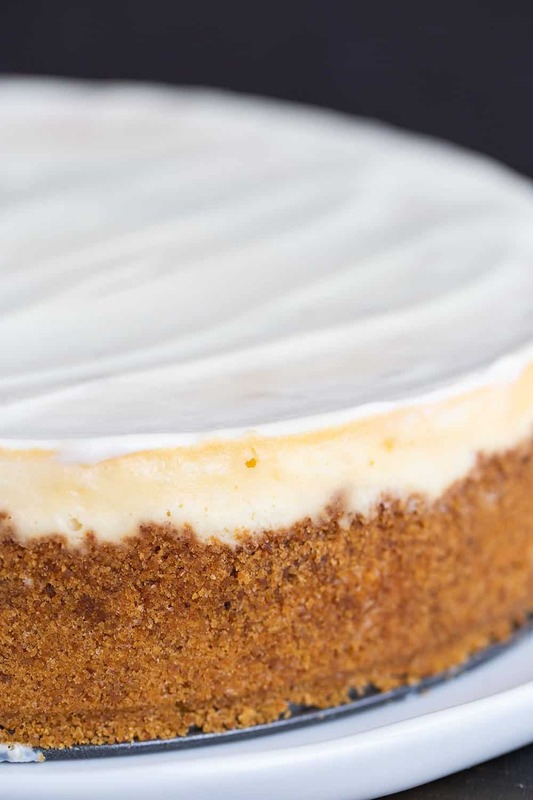 After the sour cream is added to the baked cheesecake, refrigerate for at least 4 hours. I highly recommend overnight. A water bath for cheesecake is the best way to prevent the edges of the cheesecake from browning in the oven and getting cracks in the top of the cheesecake. Simply place your springform pan with the cheesecake in it into a slightly larger pan and add about 1 inch of hot water to the outside of the pan. To keep the water from getting into the cheesecake, I like to wrap the outside of the pan with 2 layers of heavy duty tin foil. 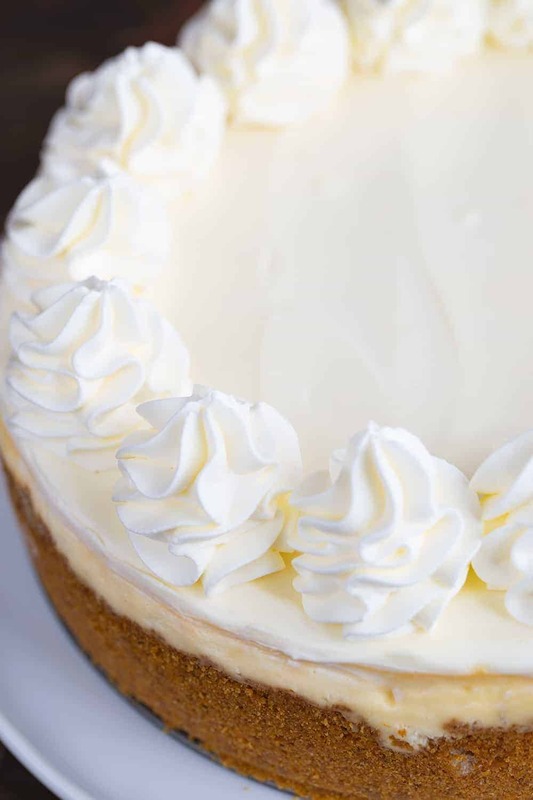 For an extra fun twist, pipe out some whipped cream dollops around the top of your cheesecake! I like a 1M tip and my homemade whipped cream recipe. 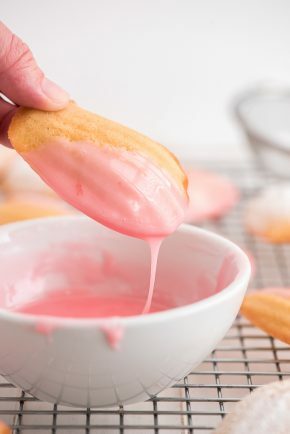 In the clean bowl of a stand mixer fitted with the whisk attachment, add the heavy whipping cream, powdered sugar, and vanilla extract. Start mixing on low speed, then increase the speed to medium-high until soft peaks form, about 3-5 minutes. Every single bite is creamy and delicious! I’m Miranda from the blog Cookie Dough and Oven Mitt. 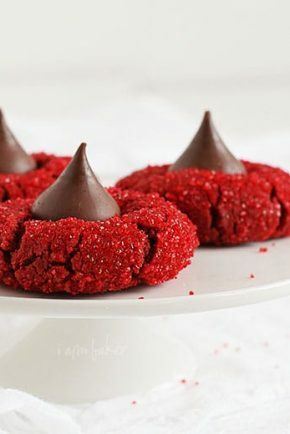 Cookie Dough and Oven Mitt is a blog full of more desserts, baked goodies, and loads of tips and tricks. Be sure to check out my Snicker’s Cheesecake Cake and Snickerdoodle Cheesecake if you love all things cheesecake! I am looking forward to making the Perfect Cheesecake. It looks delicious. Do I ever love cheesecake? This one looks so silky and creamy and dreamy. 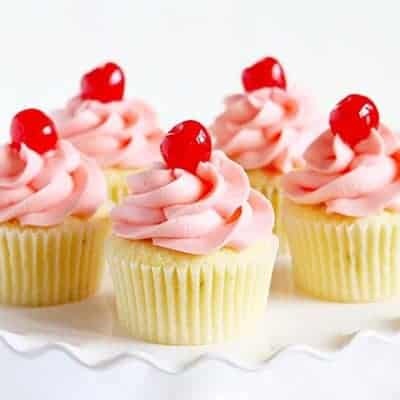 Great tips on the sour cream topping. A heirloom recipe that I use has regular sugar. I’m looking forward to trying it your way. Perfection! If you freeze you crust for 15 minutes, do you let it come back to room temp before adding the filling? Can you leave off the sour cream topping and still have a delicious cheesecake? My husband doesn’t like sour cream. 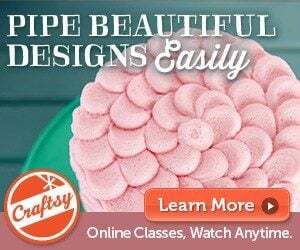 My husband makes a cheesecake almost exactly like this one! I have never seen a recipe so close to his. Everyone comments on how smooth and creamy it is too. 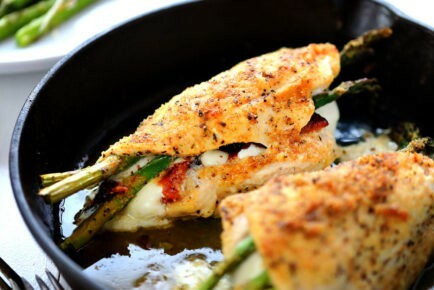 Can’t wait to make this but I don’t have a spring form pan. I have a deep dish pie pan and regular pie pans.. that would work other then not being able to remove the whole cake?? ?I will still line them with parchment…Or should I wait till I can find a spring form pan ?? Thanks for the recipe !! 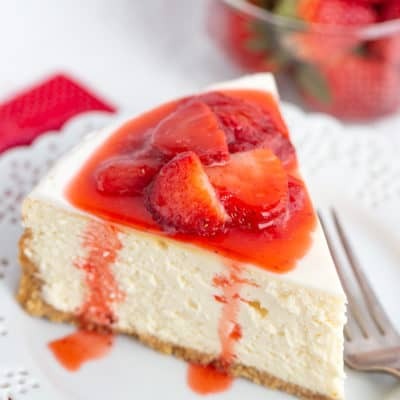 I have made a cheesecake similar to this one with the sour cream topping. A good tip: The sour cream can become runny. I strain it using cheesecloth for 24 hours in the refrigerator before using it on the cheesecake. This will make it denser and much more stable. 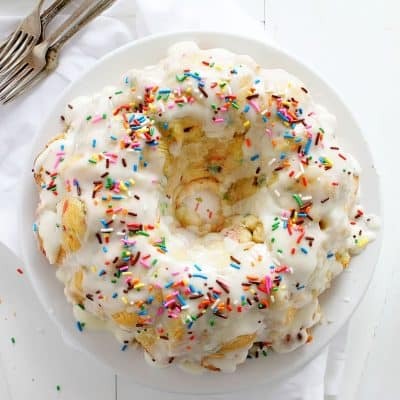 How big is the springform pan you used for this recipe? I have several sizes. Thanks! I would like to make a cheesecake in a 9/13 cake pan. Using your recipe how many mini cheese cakes can i make? 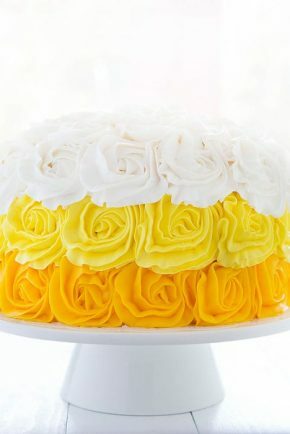 May I halve the recipe and bake this cake in 6”” springform?? There are only two of us. I have a 6-inch springforn. Could I just cut the recipe in half? If so, how long would I bake? Yes, you can halve it. (technically speaking) However, I have not halved this recipe so cannot give you accurate temperatures for that adjustment. Can you use a regular pie pan? I really love your recipes and the way you write, but it’s frustrating to try and read thru because there are SO many ads. In just this recipe alone, there were google ads LITERALLY in between every 3 sentences, a Lowes video, some hair product video, a razor video, Hilton, Cascade, Nutrisystem, Peleton, Dove, Brita, Clorox…. I get that thats how you make your money, but its kind of ridiculous. It’s almost impossible to read thru your instructions and story bc its so distracting.Sorry! I get it. I really, really do. They are ridiculous. If I had my way there would be NONE! 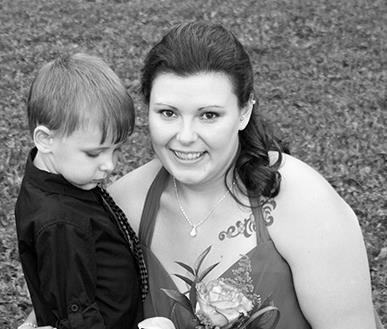 I am working on figuring out how to decrease ads… but know that I am sorry. Can’t wait to make this Cheesecake!